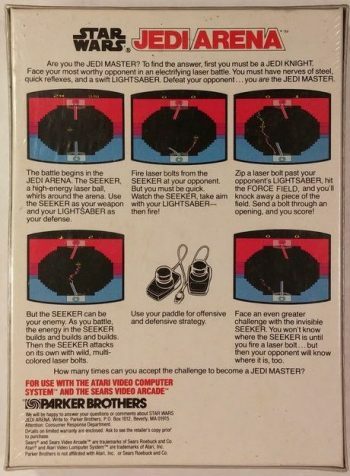 Released in 1983, amidst the Parker Brother’s deluge of Star Wars games over a two year period, Jedi Arena was unique in that is was a game with a solely multiplayer focus. Like the two that came before it, the game worked to very loosely recreate an aspect from the movies, but this time focused on creating an experience focused on two players competing against one another. Only ever seeing release on the Atari 2600, instead of the standard joystick controller, Jedi Arena made use of the Atari paddle controllers. The input device that used a large rotating knob to play games like Warlords or Breakout, for more precise movement than a stick could provide. Which made recreating the original experience of playing this game with an emulator very difficult, let me tell you. 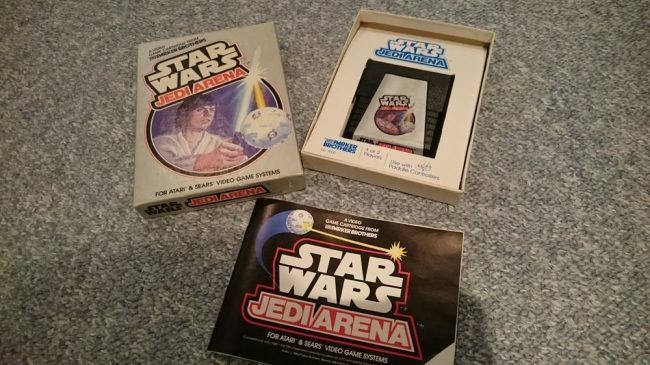 Seemingly, Jedi Arena is very loosely based on the scene from A New Hope in which Luke trains against the floating remote while aboard the Millennium Falcon, this game expands upon that and turns it into a competitive multiplayer experience. The manual for the game describes the situation as two Jedi Knights, battling one another for the right become a Jedi Master. Not really how the lore of the Jedi works today, given the years of extra material. But we’ll forgive them based on how little they had to go off back when there were only two movies. Really though, considering one player is described as the “Red Jedi Knight” in the manual, I’d have thought they’d pitch the story more as a good vs. evil thing. Anyway, how the game works is, two players stand across from one another, their lightsabers waving in front of them proudly. They also happen to be covered by a multi-layered force field. Between the both of them is a floating remote, called “the seeker” by the manual. At any time, the player can send a “laser bolt” from the remote to their opponent’s side of the screen. In a spark inspired by the shock Luke gets in the movie. A hit on the opponent’s shield knocks a chunk of it away, in a style that’s pretty reminiscent of breakout. Once the opponent’s shield is down, you need only strike one direct hit to score a point, swap sides and reset the board to start again. Where things actually become more strategic than it might first appear is that your attacks leave the seeker at the same angle that your Lightsaber is pointing. Your Lightsaber, coincidentally is also your only defence against enemy attacks. This means you’re constantly in a state of deciding whether you want to be one the attack or defence, as often, directing a laser bolt with your weapon will leave you exposed to attack from the opponent. If only to mix things up one more notch, the sounds coming from the Seeker build up to the point where it “goes wild”, overcharging and sending laser bolts out in all directions at random for a few second. During this time, both players need only defend the wayward strikes before gaining the ability to attack again. Like all of the games made for the Atari 2600, it’s a simple game, and not one that’s remembered as fondly as the ones I’ve spoken about already. But the competitive aspect of the game already gave me something to be more interested in than the previous two high score seekers. I have found a number of reviews of this game archived online spanning the 35 years since its release, not many of them positive. Due to my lack of access to the appropriate controllers for the game, I must delegate my judgement how it actually plays to the people who have played it. Almost all of them were very down on it. Although a good number of them lament the fact that the game squanders the Star Wars licence by putting two individuals with Lightsabers in the same room and not have them actually clash at any point. Some claim the controls are surprisingly imprecise for a paddle controlled game, which seems very unfortunate. And that the hit detection for the laser bolts oftentimes feels random and inconsistent. Again, pretty unfortunate. Although many of these “reviews” really fail to deal with the game itself in a vacuum. The June, 1983 issue of Electronic Fun with Computers & Games giving the most balanced review of the game I could find, which mostly criticises the badly balanced A.I. when playing the game alone, but praises it as an engaging and fun competitive experience against another human player. Which is the kind of experience a game like this lives by. We live in a time in which competitive games with pretty simple premises thrive; Divekick (2013), Lethal League (2014) and the reemergence of the 1994 arcade game Windjammers, all games that find their origin in games like Jedi Arena. I’m not making claims that there are direct lines of lineage from this game to those. 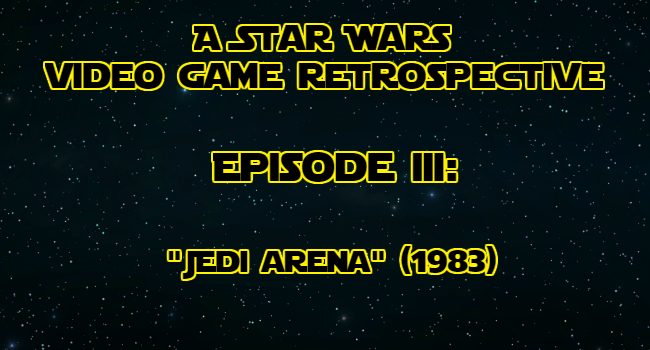 But Jedi Arena would certainly be the game for the kind of person in 1983 who would go onto love games like Windjammers years later. I feel like Star Wars: Jedi Arena was a game that probably contributed to competitive styles of video games as a whole rather than having any lasting impact on the Star Wars franchise. Really, I feel like a lot of people were a little bitter about this being the first game that puts a Lightsaber in your hands, but never lets you recreate the duels from Star Wars of Empire like you really wanted. I would have liked to try this game myself, because it interested me a lot more than the previous two from a pure video game experience and less of a Star Wars experience. Because yes, this game is only very loosely based on the franchise, a brief snippet of the main theme played when winning a point being the only real identifying mark of it being a Star Wars property at all. Which is probably why it’s not remembered as a great Star Wars experience, nor a great video game experiences if the many issues found in reviews end up being accurate. This really ends my talk about the games that found themselves on the second generation home consoles before they moved to arcades and eventually the third generation on the Famicom and NES. I might eventually start talking about the games out of order as it becomes more difficult to get my hands on them and play them myself going forward. For now though, I’ll put my hands up and say that there will always be aspects of these games I simply cannot appreciate, growing up during the fourth generation of video game consoles, having a Sega Mega Drive and Nintendo Gameboy throughout my youth. But these games were all important in their own ways and I have done my best to try and appreciate them as such. Next time I’ll talk about an arcade game that has no shortage of opinion evaluation of online, so look forward to that. Posted on January 25, 2019 January 24, 2019 by WooderonPosted in Star Wars, Video Game RetrospectivesTagged atari 2600, empire strikes back, jedi arena, lucasfilm, retro, Return of the Jedi, second console generation, Star Wars, star wars video game retrospective.